The long-awaited release of iTunes 11 ran fairly smoothly for Apple towards the close of last year, and although the completely overhauled UI does take a bit of getting used to, it would seem as though the vast majority of users have now managed to adapt. Following on from the hurried release of iTunes 11.0.1 to alleviate a bunch of teething issues back in December, Apple has just released iTunes 11.0.2 which, among a bunch of bug fixes, also adds a new Composer view, and improves playlist responses. iTunes was, in the days of the iPod, primarily a music player and portal. But despite the content having changed dramatically by the time the iPhone and later the iPad had established themselves, the look and feel of the iTunes app remained dated. The functionality (or lack thereof) was not in line with the slickness we’d come to expect from Apple, and while iTunes is still a little heavy and more resource-demanding than we’d like, iTunes 11 has certainly been a breath of fresh air. Notably, the new update adds a Composer view for Music, improved responsiveness when handling large playlists, and a bug fix for purchases that do not show up in iTunes. Various other performance enhancements are also included. You can grab it from the Updates tab in the Mac App Store now. iTunes 11.0.2 also brings a handful of bug fixes and performance enhancements, and is well worth updating to. You can either check out the new release over at Apple.com, or use the software update feature within the iTunes app. If you’re still straggling on a pre-iTunes 11 version of Apple’s famed desktop application, you may want to check out our extensive iTunes 11 review, which not only points out the vast majority of the new features, but will also help you find your feet in what can appear a somewhat alien environment. Furthermore, we also have a little how-to tutorial which will help you set it up, ensuring you don’t end up accidentally losing content (or sanity) when making the big upgrade. We haven’t had a proper chance to get a look at iTunes 11.0.2, but if we do stumble across anything not listed in the changelog, we’ll be sure to update the post accordingly. 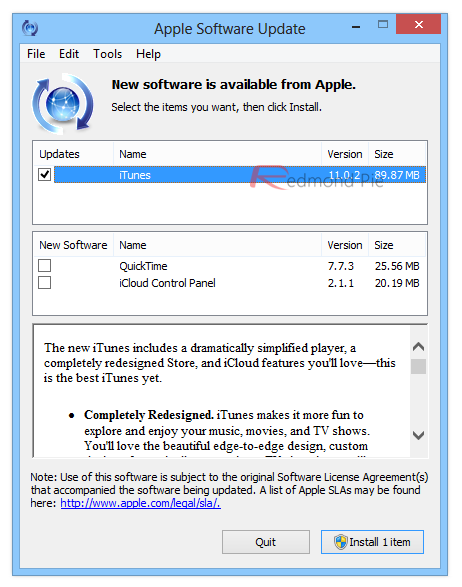 You can either download iTunes 11.0.2 directly from Apple’s website if you’re planning to do a fresh install, or simply launch the Software Update tool to update your already-existing version of iTunes on your PC or Mac.